Start saving today on battery costs. The Alkacharger is the perfect way to charge, organize, and store batteries. It’s the only battery charger that can recharge up to 34 regular Alkaline type cells at once. 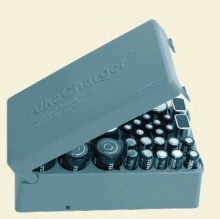 The AlkaCharger holds up to 6 D cells, 6 C cells, 10 AA cells, 10 AAA cells, and 2 9V batteries. On average, the money saved by using the AlkaCharger is about 75% of the batteries’ cost. Storing batteries in the AlkaCharger will recharge them between uses, so your batteries will always be charged and ready.